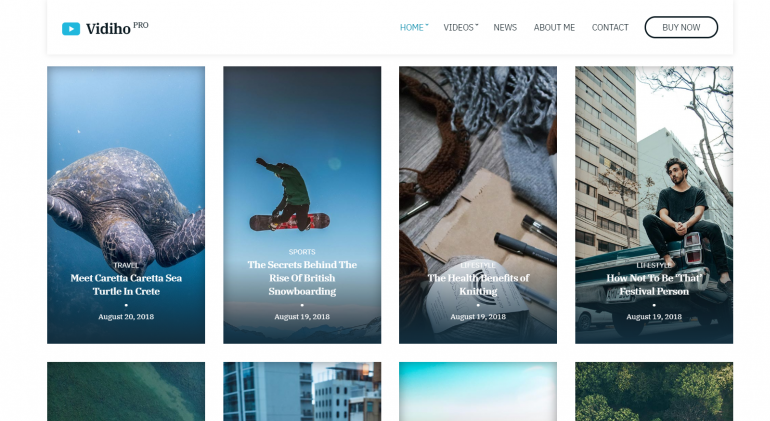 If you're a videographer, it can be hard to find a good WordPress theme. There are tons of themes for photography professionals, but many of them don't have all of the functionality that you need as a videographer. So today, we're going to look at WordPress themes that are built for videographers -- or have the functionality that videographers need. That means built in integration with video sites like Youtube and Vimeo, an interface that looks clean and supports videos without crashing the browser. 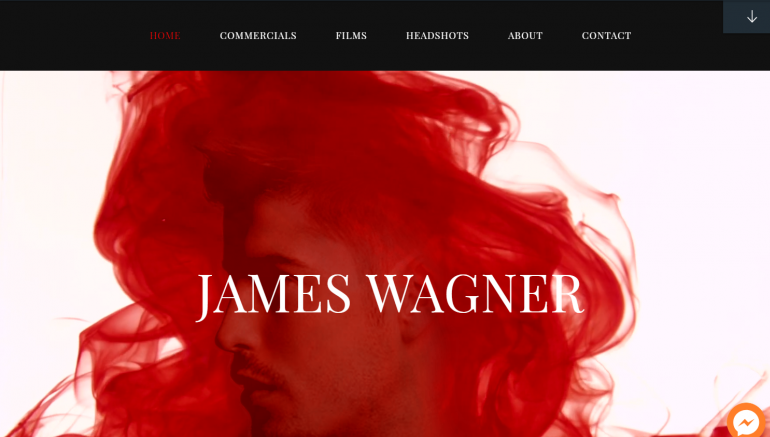 So without further ado, let's look at the best WordPress themes for videographers. This theme is called Inspiro, and it is especially great for videographers because it is designed to complement to your work. 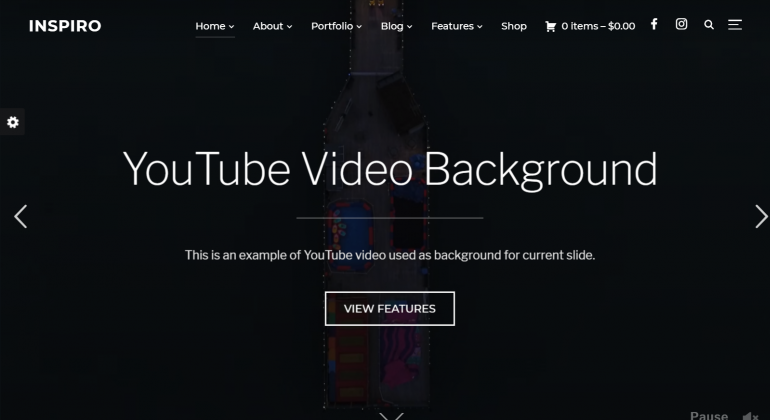 In addition to being integrated with video platforms like Youtube, this theme is excellent and colorful, and among users, it's very highly reviewed. Some of the main aspects of Inspiro are: it includes plugins, has many customization options, has a drag and drop builder, is skinable, integrates with social media, offers free suppport, and includes multiple layouts. Additional stuff included with Inspiro are icons, background images, fonts, a slider plugin, custom widgets, Retina images, and demos. This theme is a breeze to install and easy to use. Inspiro works well on tablets and mobile devices..
Reel is a beautiful theme that can be used for videographers as well as others. It makes a great website to share and showcase your videos, as well as sell your products and services. In addition to being well designed, Reel has many customization options, is SEO optimized, has a drag and drop builder, supports WooCommerce, has a 1-click install process, is skinable, offers free suppport, and includes multiple layouts. Reel enjoys a large user base, so it is quick and easy to obtain help and support. 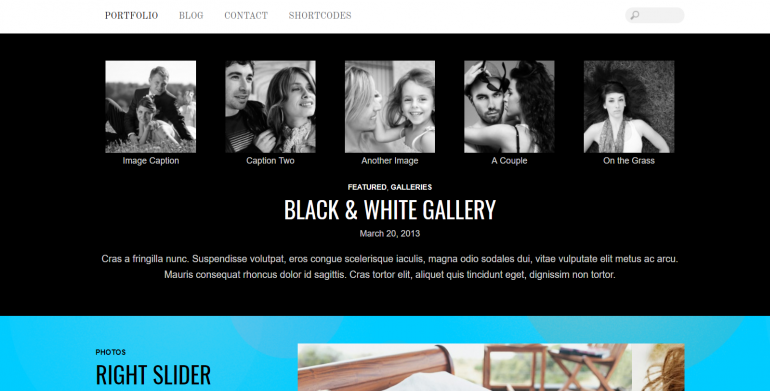 This theme is a breeze to set up and straightforward to use. Included with Reel are icons, background images, fonts, custom widgets, and demos. Reel looks great on mobile. 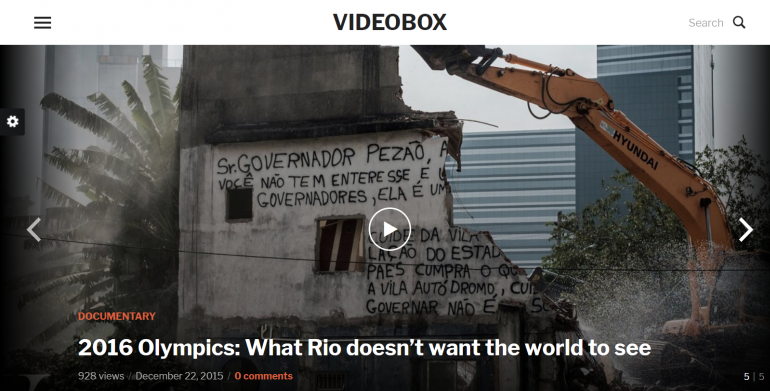 This theme is titled VideoBox, and it has some amazing features for videographers. In addition to showcasing your work, it is tightly integrated with Vimeo and Youtube, it supports automated thumbnails and embeds, and more. This theme includes plugins, provides built in search, has many customization options, is SEO optimized, has a drag and drop builder, supports WooCommerce, is skinable, integrates with social media, and offers free suppport. Also included with this theme are icons, background images, fonts, and Retina images. This theme is simple to configure and straightforward to use. VideoBox looks great on mobile. It is also multilingual. This theme is called Videozoom, and it a bit different from some of the other themes on this list. It is more of a video platform, for displaying and sharing videos. If you are a videographer and want to create a destination out of your webiste, this is for you. Included with this theme are icons, background images, fonts, custom widgets, Retina images, and demos. This theme is simple to set up although it may take experience to fully master. Videozoom works well on tablets and mobile devices.. 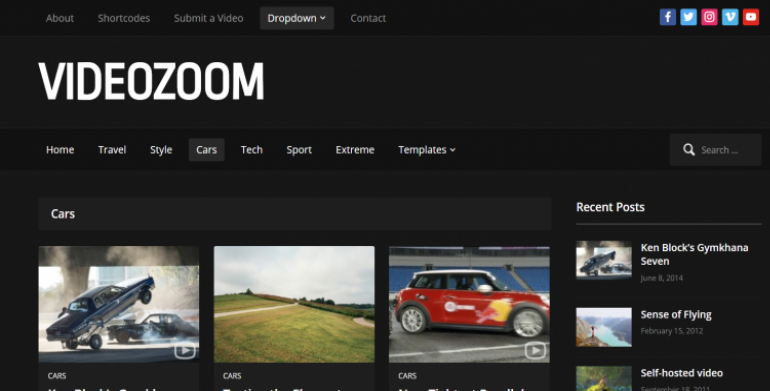 The drawback of Videozoom is that it is not simply a videographer site. Nevertheless, this theme is an distinctive option for your website. 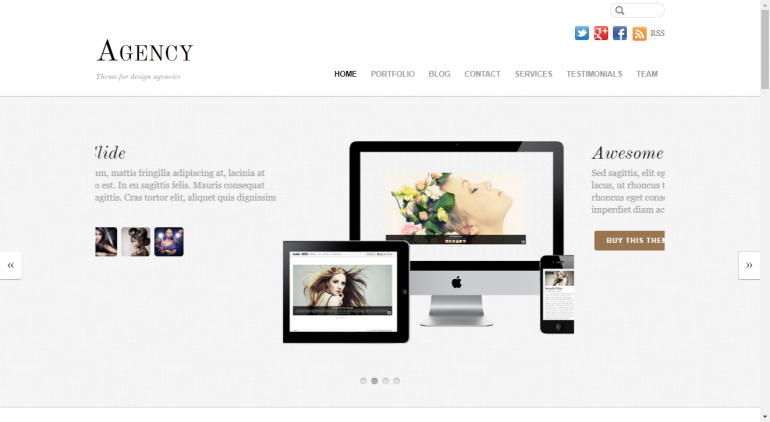 Agency is a very clean and simple theme for creative professionals, including videographers. In addition to being minimal, Agency is one of our favorite themes because it has many customization options, offers multiple color choices, and is skinable. Not only that, when you buy it you get another theme free, so you can use it for another site. This theme is named Bold, and you can find it from Themify. Although this theme is for any portfolio sites, it works great for videographers because it is colorful and refined. Top salient aspects of Bold are: it includes plugins, has many customization options, is SEO optimized, offers multiple color choices, is skinable, integrates with social media, and offers free suppport. Some of the things that come with Bold are icons, background images, and fonts. This theme is a breeze to set up and a snap to use. Bold looks great on mobile. It is also multilingual. Reel Story is a colorful theme that is made for videographers. It has deep video integration, as well as customization options, a drag and drop builder, a 1-click install process, and multiple color choices. In addition, they will install and set it up for you for FREE! Included with Reel Story are icons, background images, fonts, custom widgets, Retina images, and demos. Although it is not free, we like Reel Story due to the fact that it is attractive, professional, and lively. There's no doubt it will be a excellent complement to your website. This theme is titled Vidiho Pro, and we hear that videographers love it. Vidiho Pro is closely integrated with video platforms like Youtube and Vimeo. Some of the noteworthy features of Vidiho Pro are that it is SEO optimized, has a drag and drop builder, supports WooCommerce, offers multiple color choices, integrates with social media, and offers free suppport. This theme is simple to set up and easy to use. Vidiho Pro is popular with a large user base, so it is easy to obtain help and support. Vidiho Pro works well on tablets and mobile devices. It is also multilingual. We think this theme is an attention grabbing option for your website. This theme is titled Drone Media, and it was originally designed for arial videographers. However, it works great for any type of videographer. We picked this theme because of the tons of features it provides. It has all of the video integration features that a videographer needs, as well as almost any other feature imaginable. It includes plugins, has many customization options, is SEO optimized, has a drag and drop builder, supports WooCommerce, has a 1-click install process, offers multiple color choices, is skinable, integrates with social media, and offers free suppport. Some of the things that come with this theme are icons, background images, fonts, a slider plugin, custom widgets, Retina images, and demos. This theme is easy to set up although it can take some usage to get used to. Drone Media looks great on mobile. It is also multilingual. The drawbacks of Drone Media are that it is has many options, making configuration a bit complicated. 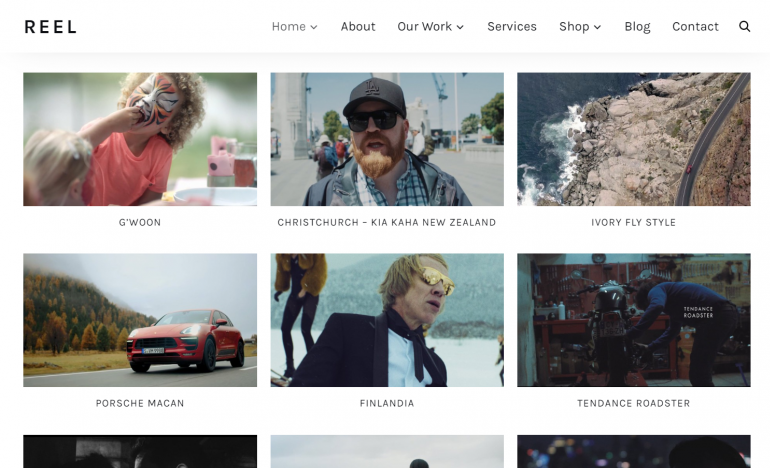 Sansara is a portfolio theme that has multiple designs just for videographers. It includes all of the standard features, such as a drag and drop builder, has a 1-click install process, integrates with social media, offers free suppport, and includes multiple layouts. Sansara is integrated with video platforms like Youtube and Vimeo, and has tons of videographer friendly features. This theme is a breeze to install and easy to use. Additional stuff included with Sansara are icons, background images, fonts, a slider plugin, Retina images, and demos. Sansara works well on tablets and mobile devices. 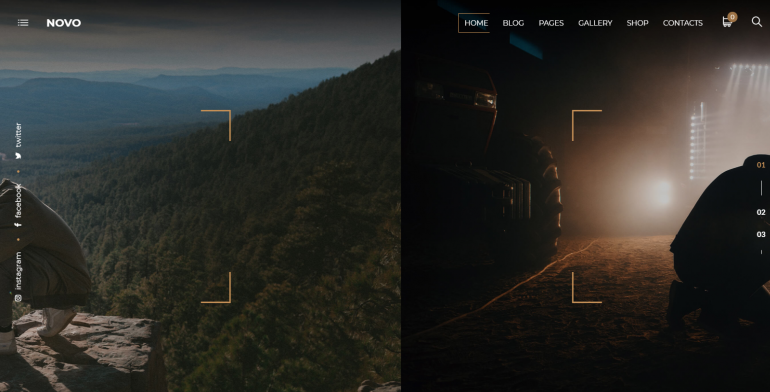 Novo is another amazing portfolio theme that has multiple layouts created just for videographers. It has a cool parallax design that makes it stand out from the crowd. In addition to being gorgeous, Novo is one of our favorite themes because it includes lots of great features, such as video site integration, image optimization, and more. It also comes with background images, a slider plugin, Retina images, and demos. Novo works well on tablets and mobile devices. It is also multilingual. Another place to look for theme options is Fiverr. On Fiverr, you can get a theme designed from scratch for under $100, or your can get an HTML site or PSD design turned into a WordPress theme for around $40. If you already have an HTML site, or if you have a design in mind, it's worth poking around Fiverr to see if there's a solution for your needs.